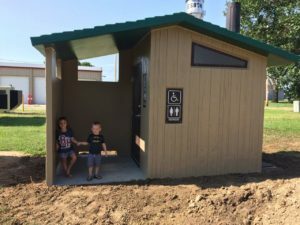 Esbon received a grant from the Dane G Hansen Foundation for a much-needed public restroom for the city park. The city had never had a public restroom. 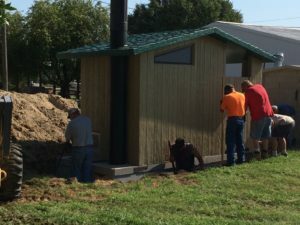 Phase one of the restroom was completed on a Sunday afternoon by a contractor and three volunteers. The ground was prepped, and the pit was dug, leveled, and compacted for the vault. Ten days later phase two was complete. The vault and restroom arrived and was set. Thirteen volunteers back filled and tamped dirt around the foundation. They all celebrated with lunch and appreciation for a job well done.